I create memorials from the design stage through to the carving and final installation, working with the ideas and sentiments of those commissioning the memorial. By taking the time to create a well-considered and sensitive design for each individual memorial, and by executing that design using fine craftsmanship, a beautiful monument with real meaning and integrity can be created. This way of working offers an alternative to the formulaic products available through regular monumental masons. The first step is usually to visit the place the memorial will be located, which may not necessarily be a graveyard. I meet with the client to discuss any ideas or wishes they have, and to explore the most fitting design, lettering, shape and type of stone for the person or event being commemorated, and for the site. I then produce sketches, and a design usually emerges at this stage which can be adjusted and refined in further discussion with the client. I usually design a letterform that is specific to each memorial. Once the design is finalised, I can provide an accurate costing for the work and order the stone. While waiting for the stone to arrive from the quarry, I produce a full-scale drawing so that carving can begin as soon as the stone is delivered. Clients are welcome to visit the studio as work progresses. Once complete, the memorial can be installed: a beautiful and enduring act of remembrance. Trinity College, Dublin commissioned a commemorative stone dedicated to those from Trinity who lost their lives in World War I. 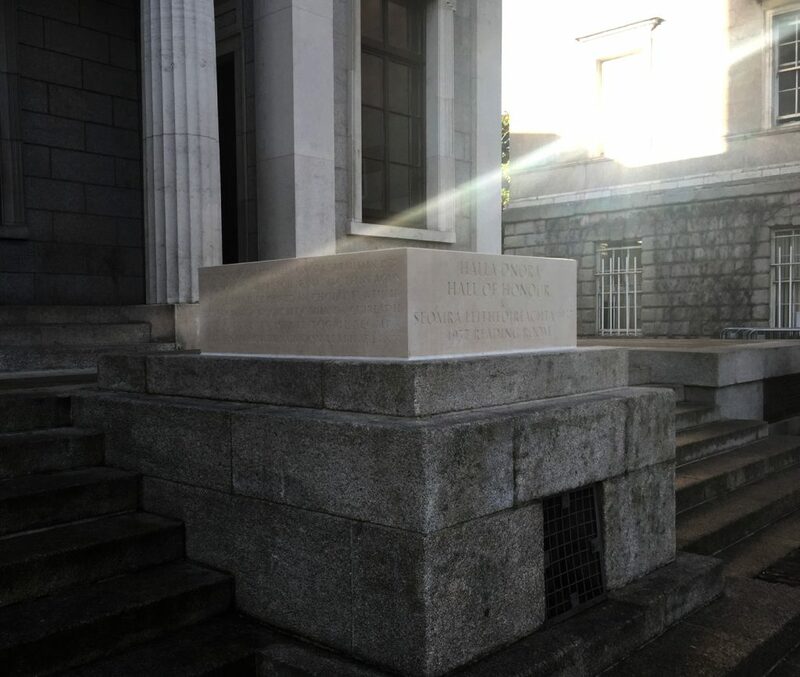 The stone sits on what was once a vacant plinth, in front of the Hall of Honour & 1937 Reading Room. A large square slab of Portland limestone was chosen for the memorial. It was a key concern that the stone would resonate with the weighty Portland limestone and granite Doric features of the Hall of Honour. Commissioned by Martello Media in 2016, The Witness Stone, carved from Kilkenny limestone, sits between the high polish of two digital screens at the GPO. The stone is a fixed commemoration around which a digital record is displayed. 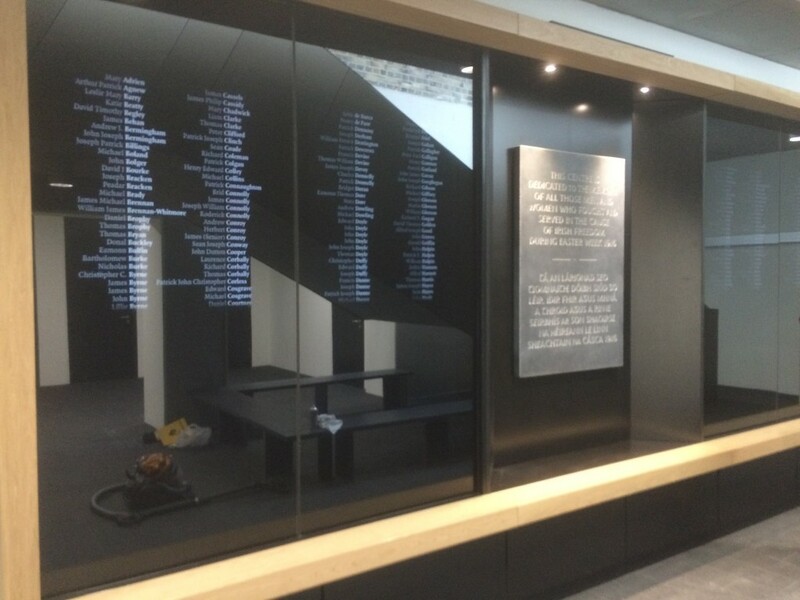 The gravitas of the stone memorial, dedicated to those who fought for the cause of Irish freedom during the 1916 Rising, compliments a digital roll call naming each individual who participated. The Clones Famine Memorial was created using Sandstone window cill slabs from a demolished workhouse in the town. Deep v-cut lettering was designed and carved into the stones which were then laid in paving in the town centre. The memorial was commissioned by Monaghan County Council and opened in 2011 by President Mary McAleese.